Parmesan Meatball Soup is the ultimate comfort food! 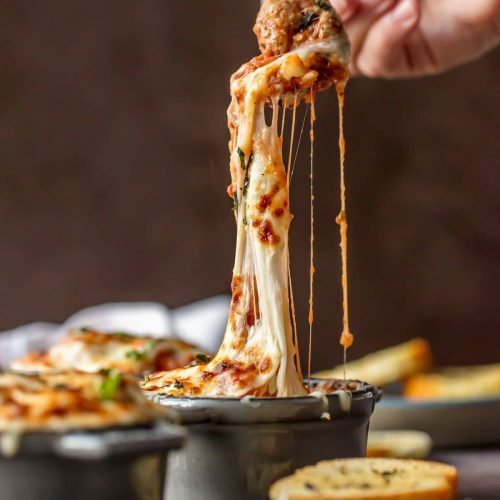 This cheesy, hearty Meatball Parmesan Soup topped with melted cheese and basil just might be the best soup you’ve had all year! 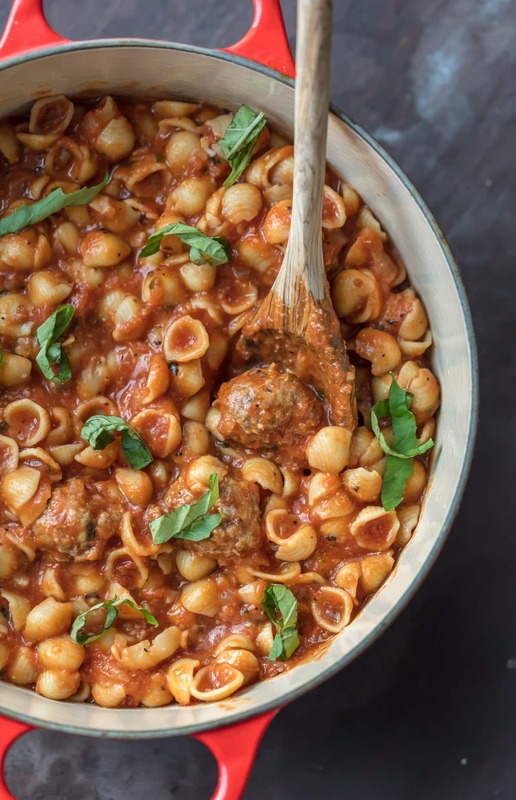 This delicious Meatball Soup is filled with shell pasta, Parmesan meatballs, garlic, onions, tomatoes, lots of cheese, and so many spices. Meatball Parmesan Soup is such a hearty and delicious recipe for winter! It’s officially SOUP SEASON! And not just any old soup…COMFORT FOOD SOUP SEASON! There’s simply nothing better than hearty, cheesy, hot soups. Nothing. Well, maybe Italian food, like pasta and meatballs. So let’s combine the two and make Cheesy Parmesan Meatball Soup! This Meatball Parmesan Soup is the ultimate indulgent soup of the season. I could eat this all winter long (and probably will). It’s so full of flavor, it’s delicious, and it’s meant to be savored. Pick any cold day the next couple months and make yourself a nice big batch, you definitely won’t regret it! This Meatball Soup with Parmesan Meatballs is the kind of recipe our family will make again and again throughout the years. It’s the kind of recipe you think about and crave days after you’ve had it for the first time. Why is it always the soups that are like that? Just like Mom’s Creamy Chicken Soup, I think this is one of her best creations yet. Make this delicious Cheesy Parmesan Meatball Soup recipe this season. 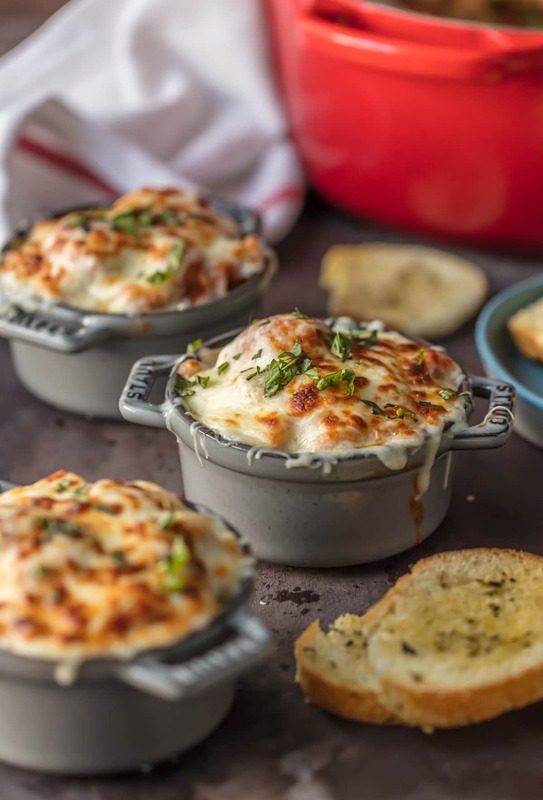 Inspired by Chicken Parmesan Soup, it’s filled with so many amazing flavors! 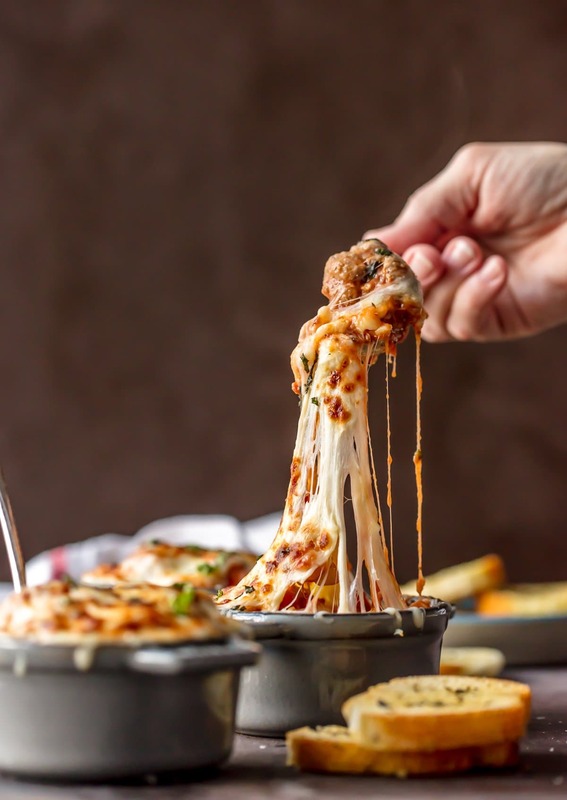 Obsession isn’t a strong enough word for how I feel about this Cheesy Meatball Parmesan Soup. 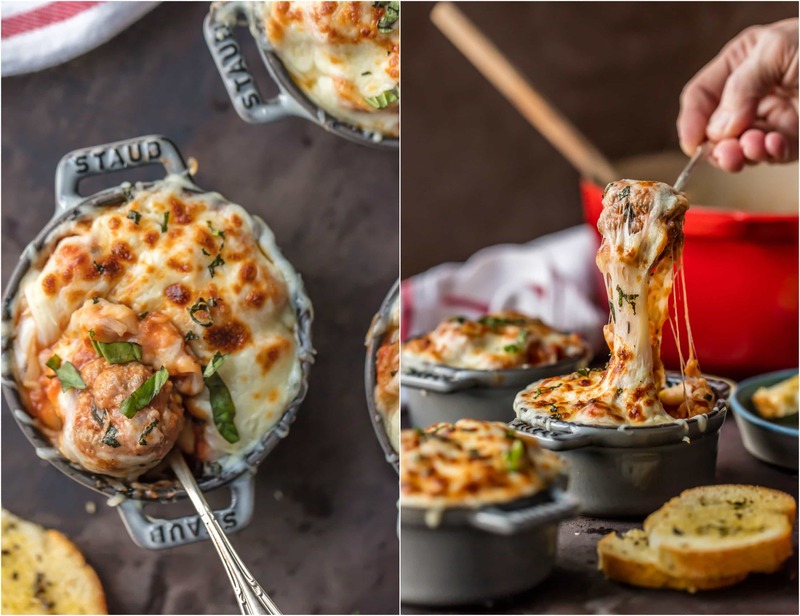 It reminds me a bit of my Chicken Parmesan Pasta Skillet, so much cheese and so much flavor. The secret is in the meatballs. Not just any old meatballs…my mom’s parmesan meatballs! Heaven. We decided to prepare the soup almost like a French Onion Soup, broiled with a layer of cheese on top. I mean, can you blame us? This recipe is easy peasy, and oh so delicious. 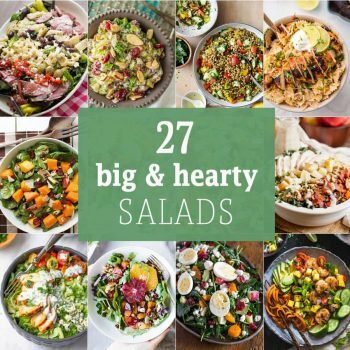 Make a big batch and save some for later! It wouldn’t be meatball soup without the delicious parmesan meatballs! While they’re only one small part of the overall soup recipe, they add so much flavor and texture. The meatballs are actually really easy to make too. Just combine all of the ingredients in a mixing bowl, then shape the mixture into 1 1/2 inch balls. This recipe makes about 22 parmesan meatballs. I added them into the soup raw–they cook up quite nicely along with the soup and add a lot of flavor that way. But you can brown the meatballs before adding them in if you prefer! Try some of our favorite meatball recipes: Swedish Meatballs, Italian Meatballs, Chicken Cordon Bleu Meatballs, and Buffalo Chicken Meatballs. I love making soups because they’re so easy. There are a lot of ingredients and so much flavor, but making soup is essentially just throwing everything into a pot and letting it cook up to perfection! That’s why I love this cheesy meatball soup. I can make it without too much stress, eat a bowl (or two) for dinner, then save the rest for another time. Make up the meatballs, throw everything into a pot, let it simmer, then add in the pasta and finish cooking. I made these extra special by baking a layer of cheese on top, like you would with French Onion Soup. 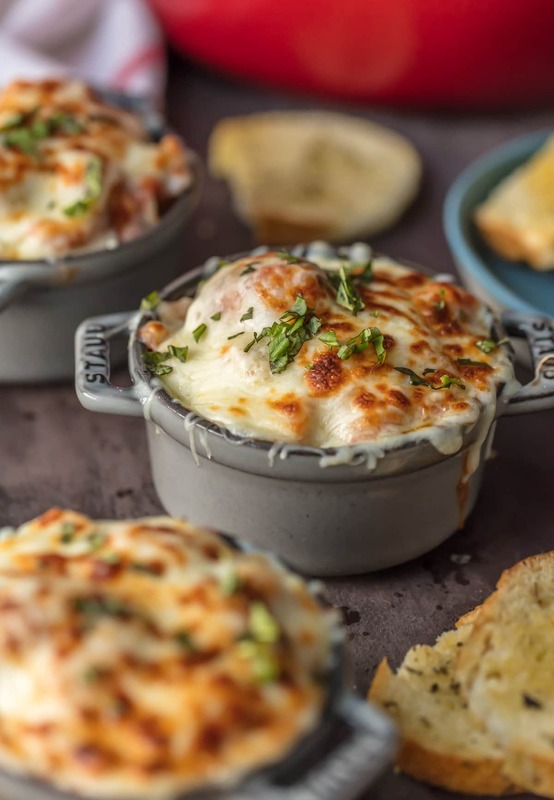 When the soup is done, ladle it into oven-safe bowls, sprinkle the cheese on top, and broil. That thick layer of cheese on top makes all the difference! Grab lots of cheese and a spoon and get to cooking! 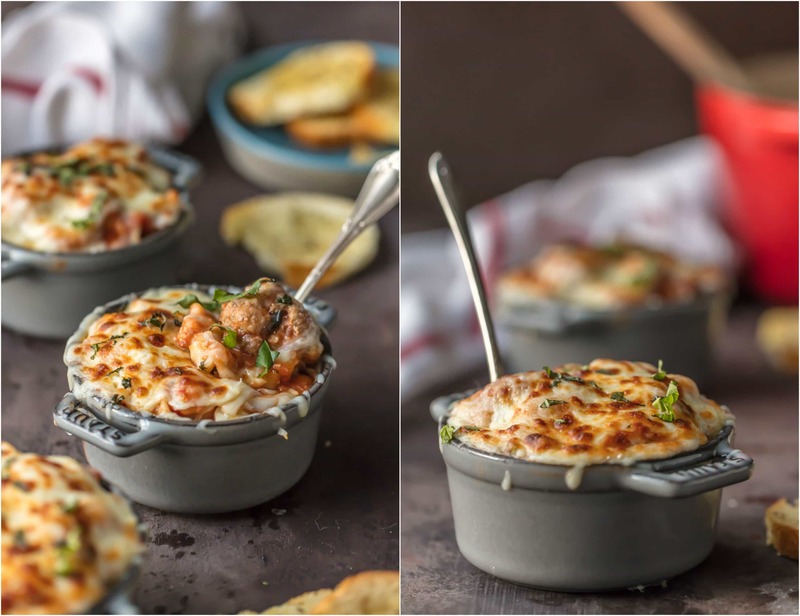 You’re going to love this Cheesy Parmesan Meatball Soup as much we do! Watch the Video and See the recipe card for details on how to make Parmesan Meatball Soup. Enjoy! Parmesan Meatball Soup is the ultimate comfort food! 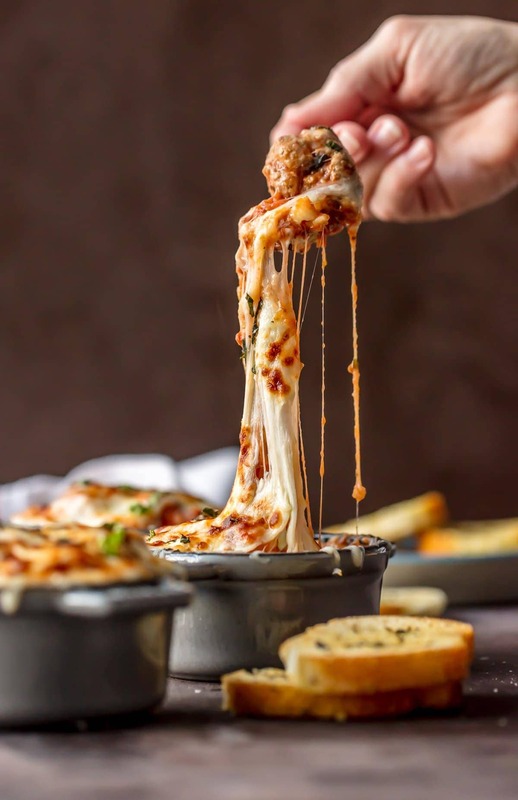 This cheesy, hearty Meatball Parmesan Soup topped with melted cheese and basil just might be the best soup you've had all year! Combine all meatball ingredients in a large mixing bowl and gently mix together until ingredients are well combined. Shape into 1½-inch balls and set aside. In a Dutch oven or a large, heavy bottomed saucepan, heat olive oil and butter. Sauté the diced onion until it is translucent and soft. Add the minced garlic to the onion and cook 30 seconds more. Add chicken broth, meatballs (we add them into the soup raw, without browning them. If you prefer to brown them, you can, but it's not necessary. Allowing them to cook into the soup adds some nice flavor! ), crushed tomatoes, sugar water, basil, Italian seasoning, salt, black pepper, bay leaves, oregano and red pepper flakes. Stir and bring to a boil. Reduce heat to simmer and cook 30 minutes. Add the dried pasta. Simmer, and stir occasionally, until the pasta is cooked to Al denté (still a little firm) 10 minutes. Add 1/3rd grated Parmesan cheese and stir. Cook over low heat until cheese has melted and soup has thickened. Place bowls, evenly spaced, on a rimmed baking sheet. 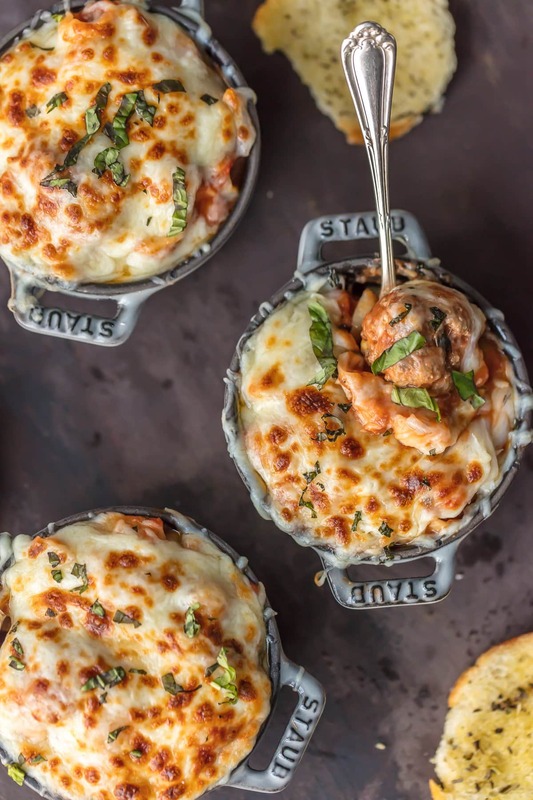 Ladle soup into oven-proof bowls, and top with ¼ cup shredded cheese. Broil until cheese is bubbly and melted. **Watch closely! Remove from the oven and garnish with chopped fresh basil and serve. So sorry! I fixed the recipe. In step 3. Thanks for letting me know! When and how do you cook the meatballs and when do you add them to the mix? Did I miss something? So sorry, I just fixed the recipe. We added them in raw and didn’t brown them first, in step 3. You can brown them if you prefer them that way, but no need to! You don’t say how to cook meatballs and when to add to the soup? Where are the meatballs in your meatball soup?? Thank you. I love your recipes!! Thank you so much!!! Sorry again for the trouble. What do you do with the set aside meatballs? This recipe looks delicious! Can’t wait to try! Hope you love it Jane! Thanks for saying hi. Thanks Vishnu! Hope you love it! I just made this for dinner tonight. I saw the post on Instagram and although I’m NOT a soup lover, the picture looked so good I had to try it. OMG, this is transcendent! My 4-yr-old, who I have a nightly dinner battle with, ASKED FOR SECONDS!!! This is nothing short of a miracle as that only happens with chicken nuggets or mac’n’cheese. I am definitely keeping this recipe on hand, and it will probably make it in our regular rotation as well, Thanks for sharing! I love it! YAY! This is so wonderful! Best comment ever, and I just love when the kids love it too! Thanks for letting us know! It was a cold & snowy day yesterday, so it was the perfect time to try this recipe. OMG! I am totally in love with this soup. In fact, I’m eating the leftovers while I am typing this comment. 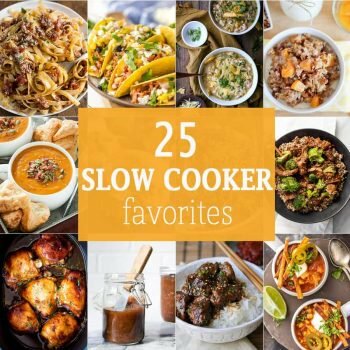 I am a new reader, so this is the first of your recipes that I have tried. It definitely won’t be the last! Thank you, thank you, thank you!!! SO happy to hear that! My favorite type of comment. I can’t thank you enough for stopping by and letting us know you loved it. So happy to have you here!